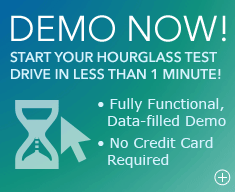 HourGlass offers all of the advantages of a leased application, including low monthly user fees. We offer two payment plans: a flexible monthly plan and an annual payment plan with a 33% discount over the already low monthly payment plan price! Monthly: for $15 per person, where your licenses are renewed monthly for as long as you like. Annual: for $120 per person (that's $10/month! ), where your licenses are renewed annually for as long as you like. You can upgrade your monthly license(s) to an annual payment plan any time and save 33% off the monthly price. 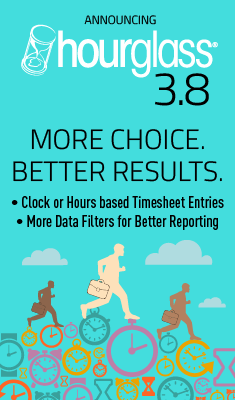 You can even mix and match annual and monthly licenses to accommodate full-time or part-time employees as well as contractors. Remember, there are no sign-up fees, no setup fees, no termination fees, no hidden costs and you can cancel at any time. Credit card payment only, we accept Visa, MasterCard and American Express. Pricing and terms subject to change without notice. Please note there are no refunds. HourGlass provides online access to its time tracking and project management solutions to all subscribers. The solution is hosted on our secure servers and accessed via the Internet through your standard web browser. 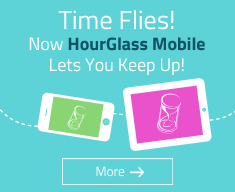 Each person who uses HourGlass needs their own license. A subscription is an agreement to receive access to HourGlass services. Within a given subscription, all licenses are from the same Payment Plan (see below) and are renewed on the same date. All subscriptions have at least one license and include 24/7 online support, updates, archiving and best of all; no sign-up fees, no setup fees, no termination fees, no hidden costs and you can cancel at any time. Canadian customers will be billed in Canadian dollars and are subject to sales taxes, all international customers will be billed in US dollars. Custom reports, importing current data, integration with legacy applications, and other services are available on an as-quoted basis. Please note that after the trial period, technical support requests will be subject to a $60 charge for every incident. However, general feedback, bug reports, and some other service-related inquiries will be exempt from this charge. Each request will be evaluated by our support team, and if your particular case is deemed to be subject to the technical support charge, you will be contacted by one of our representatives before the charge is applied to your account. HourGlass customers in Canada are billed in Canadian dollars. All other HourGlass customers are billed in US dollars.